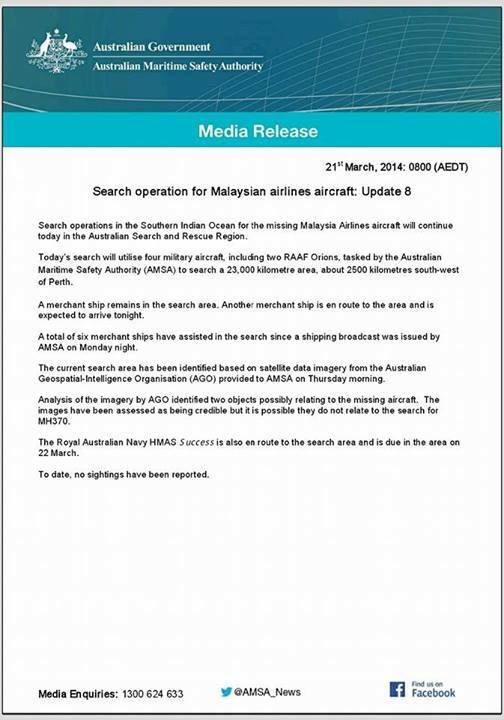 MH370 Day 14 – footsteps……..
Another day begins with new hope from the Australian Setelite sighting of probable parts of missing MH370 in the Indian Ocean south West of Perth. Ships had been scrambled to the site with the hope to catch the object before being washed somewhere else by the strong current. To date nothing had been sighted. Australian authority advise not to give all hope that the objects are really from MH370 because it might be other objects fallen from cargo ships. Up until the 5.30 pm Press Conference by Acting Transport Minister of Malaysia there is still now conformation from AMSA. Meanwhile Search and Rescue aircraft from participating nations had congregated at Subang Airport turning it into the likes of a United Nations airport. These aircraft are ready to fly upon instructed.